Wall Street, Main Street: Was last year's drop in Staten Island foreclosures just the calm before the storm? Was last year's drop in Staten Island foreclosures just the calm before the storm? STATEN ISLAND, N.Y. -- Foreclosure filings on Staten Island last year dropped sharply from 2009, but defense lawyers and others say the numbers represent a misleading lull, as banks, under fire over the integrity of the foreclosure process, regroup. 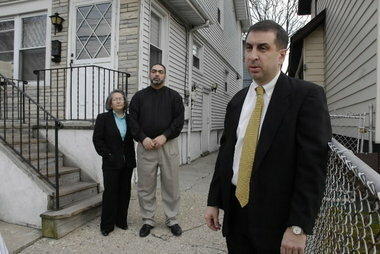 Staten Island Advance/ Bill LyonsNilda Martinez and Ruben Martinez stand in front of their home on Coursen Place in Clifton with their attorney Robert Brown, right. Brown was able to stop foreclosure and is countersuing the bank. Many expect an avalanche of new filings this year to negate the 22 percent dip from the 2,361 foreclosure filings in 2009 to the 1,846 filings in 2010 recorded in the Richmond County Clerk's office. "I think in 2011 there's going to be a huge spike once [banks and their lawyers] get their arms around what they're going to do," said Robert E. Brown, a New Dorp-based foreclosure defense attorney. "People aren't paying their mortgages. There's just as many people going into default as did six months ago. It's just that the banks are being more careful in filing suit." Valerie Wonica of Wonica Realtors & Appraisers agreed. "I don't think it's a trend," she said of last year's decrease in filings. "I think a lot of it's in the pipeline. [Banks are] making sure all of their paperwork is being done correctly." Brown said some banks stopped new foreclosure filings late last summer in response to probes by attorneys general around the country. In numerous cases, there were questions about the actual ownership of the mortgage being foreclosed on, said Margaret Becker, lead attorney with the Homeowner Defense Project of Staten Island Legal Services in St. George. "A huge, huge issue is who owns the mortgage, and can they prove who owns it," she said, noting that mortgage securities were often improperly bundled and passed from one bank and servicing company to another. In other instances, affidavits attesting to the foreclosure documents' accuracy were signed by bank representatives who never looked at them, she said. Brown said employees of some banks signed hundreds of affidavits each day without checking records, a process called "robo-signing." In October, Jonathan Lippman, New York state's chief judge, put the onus on banks' lawyers to ensure proper foreclosure filings. He required that attorneys sign an affidavit verifying the documents' accuracy. The lawyer must also name the person at the lending institution who supplied the information and certify his own examination of the papers. "I think a lot of lawyers are skittish to do it," said Brown, adding that Staten Island judges are vigorously enforcing the mandate. Foreclosure filings in the borough dipped to 78 in December, compared to 224 in December 2009. That represented a 65 percent decline. There were 81 foreclosure filings in November, down 61 percent from the 209 filings in November 2009. According to published reports, foreclosure filings in mid-December also dropped sharply in counties that have high filing volumes, including Brooklyn, Queens and Suffolk County. Brown believes that's just the calm before the storm. "All they're doing is deferring the filings they'd normally be doing now," he said, adding that some discontinued foreclosures will be re-started. While Brown expects foreclosure filings to jump this year, Ms. Becker said it's hard to say for sure. Many foreclosures are the result of predatory lending practices, and those types of mortgages declined heavily in 2007 and 2008 with collapses in real-estate and financial markets, she said. As a result, new mortgage applications slowed, and more current foreclosure filings are primarily due to homeowners' unemployment, said Ms. Becker. The economy has shown some signs of life, yet the national unemployment rate remains at more than 9 percent -- up from about 5 percent in 2008. Some experts, like Jonathan Peters, professor of finance at the College of Staten Island, say the country needs to create 8 million jobs just to match the ones it lost in the latest recession. That's not likely to happen soon, they say. In the meantime, bankruptcy filings are up significantly on Staten Island. Still, the news isn't all bad for beleaguered homeowners. Eligible residents can obtain mortgage modifications through the federal Home Affordable Modification Program (HAMP). Ms. Becker said the process has "gotten better" and likely accounts for some of the dip in foreclosure filings, although some cases still drag on for months. "It's positive any time foreclosures go down," said Sandy Krueger, chief executive officer of the Staten Island Board of Realtors (SIBOR). "Certainly, there's a lot of re-financing going on, so people had an opportunity to lower their payments and stay in their homes." Brown, however, maintains HAMP isn't working as well as it should. "I think in a lot of ways it's a terrible failure," he said. "I don't think the banks are efficiently set up to deal with the problem." And if cash-strapped borough residents can't modify their mortgages, there's going to be even more pain in store this year, he said.